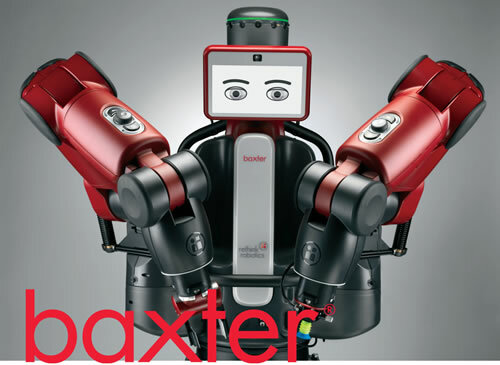 CoThink Robotics has exclusive rights for distribution of Baxter Robots in North America. For decades, manufacturers have had very few cost-effective options for low volume, high mix production jobs. Then came Baxter – the first safe, flexible, affordable alternative to fixed automation. Companies globally have integrated Baxter into their workforce, and gained a competitive advantage. Baxter is a proven industrial automation solution for a wide range of tasks – from line loading and machine tending, to packaging and material handling. Baxter is safe next to people on a production line, without the need for caging – saving money and valuable floor space. Baxter deploys quickly and can connect to other automation in the work cell – often without third party integration. Baxter, powered by Intera, is trained by demonstration using existing personnel, reducing time and cost. The patented technology in Baxter’s joints respond to force, allowing it to “feel” its way into fixtures. Baxter is flexible for a range of applications and re-trainable across lines and tasks – it can be repurposed quickly across jobs. With 7 DoF Baxter’s arms can maneuver much like a human’s arms, and reduce work cell reconfiguration. CoThink Robotics is the sole distributor with global distribution rights for the remaining Baxter Robots that were manufactured in the USA. The Baxter robot from ReThink Robotics is ideally suited for universities and research. Its open-source back-end and collaborative development community allow for customization and learning. The Baxter robot is already in several college institutions and research facilities. Contact us to learn more and get one of the few remaining robots.